A prominent artist of the Neapolitan Baroque painting, Gargiulo was the son of a sword maker. This earned Domenico the nickname Micco Spadaro. 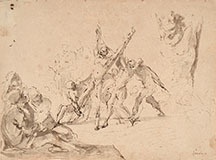 His first training was in the workshop of the battle-painter Aniello Falcone, where he would have met Andrea de Lione and Salvator Rosa. The date also coincides with the brief return to Naples of Filippo Napoletano, an artist who stimulated a taste for landscape painting, an interest shared by our artist with his workshop companions. Spadaro quickly showed a talent in the depiction of the crowded city scenes which earned him the esteem of the famous Flemish merchant and collector Gaspar Roomer. Equally important in his career were the commissions from the monks of the Certosa di San Martino. Micco Spadaro also worked with Viviano Codazzi, to whose architectural paintings he added the figures. Giancarlo Sestieri, Brigitte Daprà, Domenico Gargiulo detto Micco Spadaro: paesaggista e cronista napoletano, Milan and Rome, 1994. Brigitte Daprà, Micco Spadaro. Napoli al tempo di Masaniello, exhibition catalogue, Naples, 2002.